Today I’m going to take you to the moon! 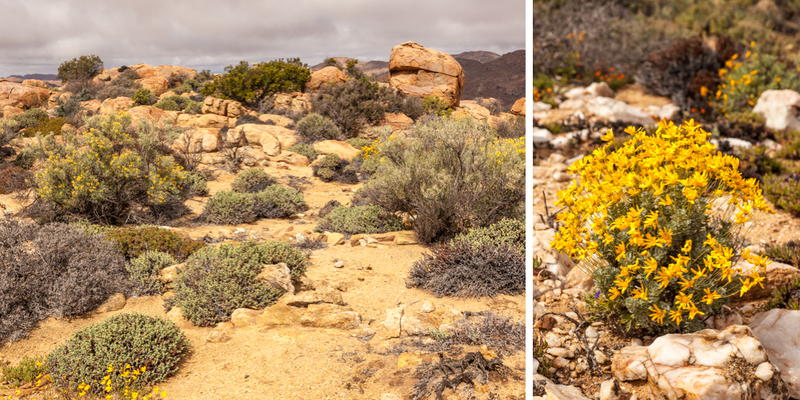 Well, almost that is, for when you visit Goegap Nature Reserve you could be forgiven for thinking you’ve just landed on the moon as the landscape is rather barren for most of the year and only visibly comes to life in spring after the winter rains. In the first part of my voyage through the paintbox the colours are very bright and cheerful, lots of orange and yellow. So I thought before immersing ourselves again in fiery hues and shades, let’s explore the fascinating Goegap. 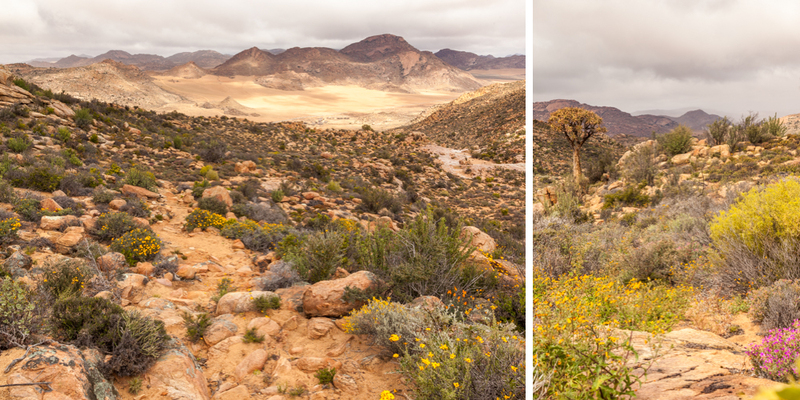 This Nature Reserve lies about 15km east of Springbok in the Northern Cape. 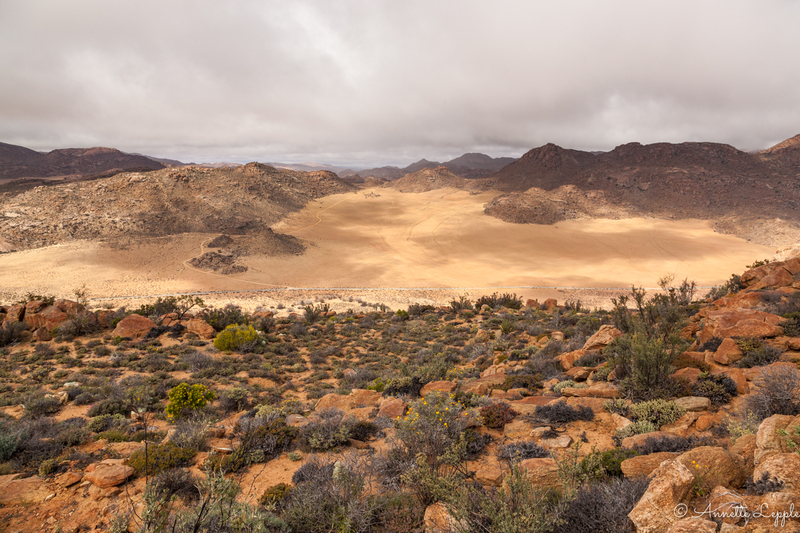 It is dominated by sandy plains and granite peaks, Carolusberg (1330m) being the highest of them. 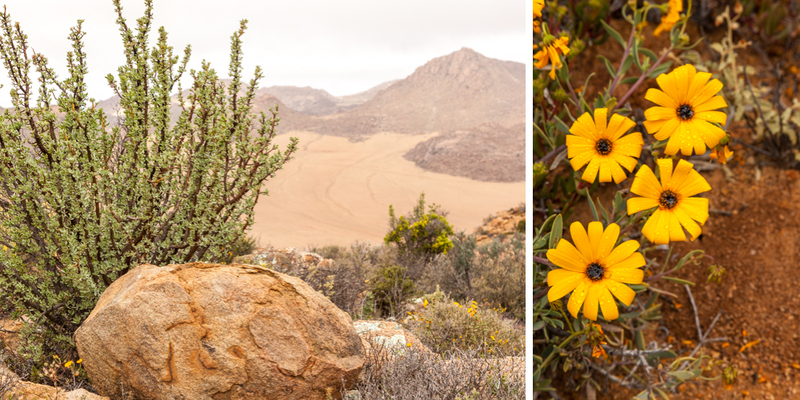 Apart from an incredible number of flowers species there are 45 mammalian species (like springbok, mountain zebra…) and over 90 bird species. If you’ve ever been to South Africa you’ll know that birding quickly turns into an obsession! It was overcast and drizzly on the day I visited Goegap and I left our small group to go hiking. The weather was the reason why most of the flowers weren’t fully open. It was true bliss to go off on my own and I quickly lost track of time…as photographers do! Ask poor Monsieur. 😉 So when I finally arrived back at the visitor centre, I was met by a very anxious guide who had almost written me off, seeing me disappear in the belly of a hungry hyena or something. We had the most charming and patient guide and I still feel a little guilty about being late, so dear Louis, I hope you’ve forgiven me. 🙂 Are you ready? Great, let’s go! Heute nehme ich euch mit auf den Mond! Auf jeden Fall fast, denn wenn ihr zum ersten Mal das Goegap Naturreservat besucht, werdet ihr meinen, genau auf dem Mond gelandet zu sein, denn die Landschaft ist die meiste Zeit des Jahres sehr karg und erwacht nur im Frühling –nach einem regenreichen Winter– sichtbar zum Leben. Im 1. Teil meiner Reise durch den Farbkasten sind die Farben lebhaft und fröhlich, viel Gelb und Orange. So dachte ich mir, lasst uns das faszinierende Goegap erforschen, bevor wir uns wieder den feurigen Farben zuwenden. 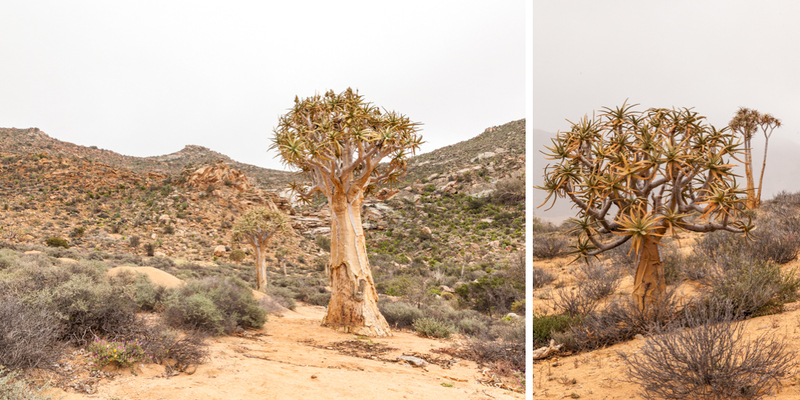 Das Naturreservat liegt etwa 15km östlich von Springbok im Nordkap. Sandige Ebenen und Granithügel dominieren die Landschaft. Der Carolusberg (1330m) ist der höchste Hügel. Abgesehen von einer unglaublichen Anzahl von Blumenarten gibt es 45 Säugetierarten (z.B. Springbock, Bergzebra…) und über 90 Vogelarten. Wenn ihr schon mal in Südafrika gewesen seid, dann wisst ihr, dass das Beobachten von Vögeln schnell zur Besessenheit wird! Es war bedeckt und regnerisch an dem Tag, als ich das Goegap besuchte und ich verliess die Gruppe, um allein eine Wanderung zu unternehmen. Das Wetter ist übrigens der Grund, warum die meisten Blüten nicht richtig geöffnet waren. Es war die reine Wonne, allein loszuziehen, und ich verlor schnell das Zeitgefühl…wie es Fotografen halt so geht! Fragt den armen Monsieur. 😉 Als ich schliesslich am Besucherzentrum eintraf, tigerte bereits ein äusserst besorgter Führer hin und her. Ich glaube, er hatte mich im Geist schon im Bauch einer Hyäne verschwinden sehen. Wir hatten einen so reizenden, geduldigen Führer, und ich fühle mich noch immer etwas schuldig, lieber Louis, ich hoffe, du hast mir mittlerweile vergeben. 🙂 Seid ihr soweit? Super, dann lasst uns gehen! Prev In a Vase on a Monday: I’m late!!! Amazing; what an incredible landscsape and what fabulous flowers. You must have been in heaven. I see an Albuca there, I grow 2 or 3 different ones, Albuca shawii is my favourite. 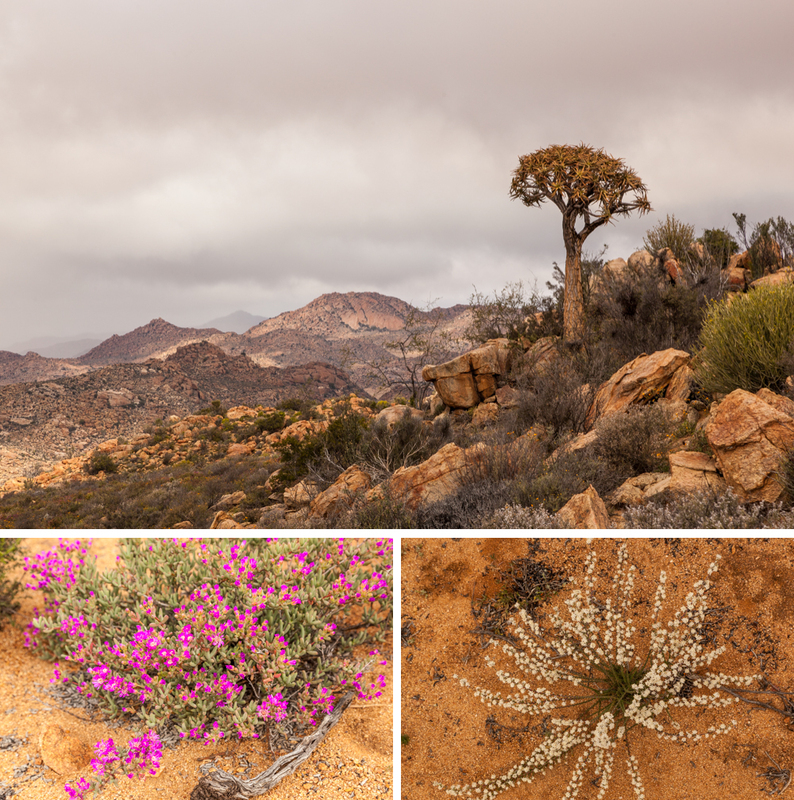 It surely is a fascinating place for lovers of all things wild, Anna, so much to see in even the most barren places. Once you start to have a close look the variety is mind-blowing. 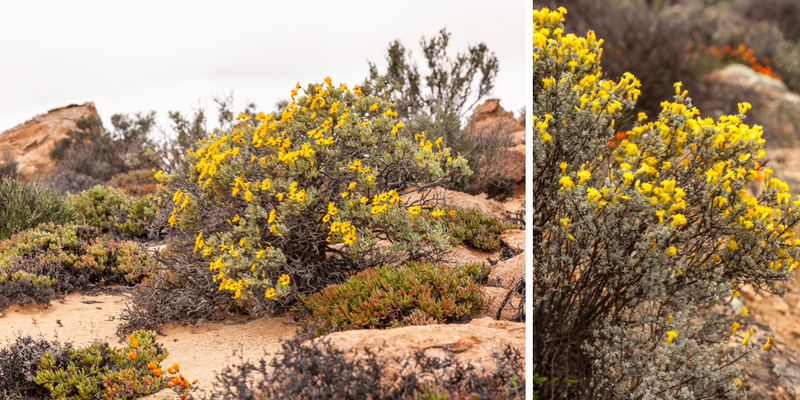 zum Fynbos kommen wir auch noch, den gibt’s weiter südlich 😉 schöne Woche wünsche ich dir! What an adventure you have been on, a feast for body and soul and wonderful photographs, but fortunately not for hungry hyenas! Sometimes I think plants are smarter than humans at adapting to their environment. Beautiful and interesting pictures, Annette. From the first expansive shot I didn’t see it coming—all the rich color you discovered. 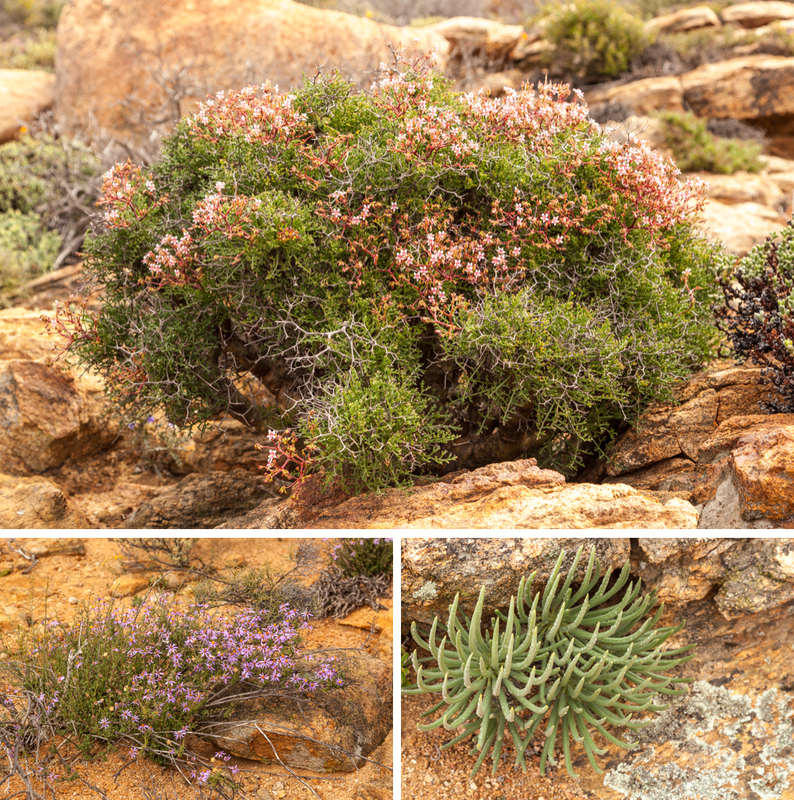 Fascinating to see such different plant life Annette, and your photos are fabulous. There is more colour in there than you might expect. Glad the hyenas didn’t get you! 😉 I bet the scenery was ironically ‚refreshing‘ after seeing our gardens suffer in the drought this summer. Thanks for sharing! The diversity in such an obviuosly hostile environment is just mind-blowing. Thanks for coming along, Cathy, I wonder how next year will turn out for our gardens. I’d be the first one to make a succulent garden but sadly soil and winter rain won’t allow it.